My boss's wife just had eye surgery. It went well and she was taken home this afternoon for recovery. She has to, of course, wear a patch over her eye during the healing process. 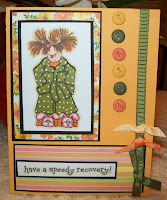 I made this card to send to her using Stampingbella's Alexis Bad Hair Day image and the Speedy Recovery sentiment also from Stampingbella. I pieced Alexis' robe with Papertrey's Bitty Dot Basic in Ripe Avacado and their Summer Sunrise as the base of the card. The stripe at the bottom is from my stash (unknown source). I backed each layer with Stampin' Up's basic black and also used their grosgrain ribbon in Old Olive, Summer Sun, and Apricot Appeal. The buttons are a close match and come from various sources. I used Copics to finish coloring the image and freehanded the eye patch. I hope she gets a little chuckle from the card and it helps to speed her recovery. Thank you for stopping by and come back again real soon! this is super cute, mom!!!! i love the eyepatch! that paper at the bottom that you can't remember where it came from---i gave it to you. it's from My Favorite Things. wink! Love the eye patch Mom!! !